Mom, the Intern: Best freaking cookies ever!!! So, you know how every mom has her go-to, awesome cookie recipe that everyone loves, and it eventually makes her famous? I think I found mine. Here are some tips I have discovered for making them extra yummy. --DO NOT substitute butter or shortening for the margarine. I know the temptation is there, but ignore it. You need margarine so they will be soft and chewy. Use butter and they will be flat and crispy. Don't even think you can do half butter, half margarine, either. ALL MARGARINE. I learned the hard way. --I chill the dough in the freezer for about 30 minutes because they're easier to roll into balls after that. This dough is pretty sticky otherwise. --Make sure to bake them long enough. I normally love cookies a little underdone, but these need to be fully done for the chewy, soft effect. Otherwise, the molasses kind of pools up in the middle and they're kinda soggy and flat. I bake mine for exactly 8 minutes so the edges don't get hard. When I take them out, they are kind of domed and cracked on top. Eventually, they collapse a little and they're perfect. These are so yummy, I've already had four this morning. Heaven, help me! 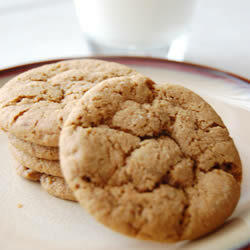 They are perfect for the holidays, too, because they have that warm gingery flavor. Make them -- I promise, you won't be disappointed! YUM. Please tell me why I have some mental block about doing my 10 things post. I'm seriously retarded.